Mestek, Inc. is a Massachusetts-based manufacturer and distributor of heating, ventilation and air conditioning (HVAC) equipment, as well as metal forming equipment. The company owns a variety of subsidiaries, some founded over 100 years ago. Formerly traded on the NYSE, Mestek conducted a reverse split and de-registered in 2005, spinning off its Omegaflex subsidiary to shareholders. Mestek is controlled by father and son team John E. Reed and Stewart B Reed, who together own a majority of shares outstanding. Mestek has a long history of profitability, showing a profit in every year since 1990 except for 2002 and 2003, when the company was walloped with environmental charges. The HVAC business is not a growth industry, but should grow at similar rate as the economy in the long run. In the short run, the industry is heavily dependent on the construction and housing industries. It should be no surprise that Mestek’s revenues have trended downward since 2006. The most recent twelve month period (through September 30, 2011) shows an increase in revenues of 7.00% over 2010, appearing to indicate that the HVAC industry has bottomed and is beginning a new growth cycle. In its most recent quarterly report, Mestek notes that its new, energy-efficient products have seen rapidly increasing sales. Here is a look at Mestek’s actual historical results, including the loss-making Carecentric. Figures for years 2005 and earlier have been excluded, since they include Omegaflex revenues and earnings. Beyond generating strong earnings, Mestek has been an outstanding generator of free cash flow. In the five previous full fiscal years, Mestek earned $26.16 million, but generated $57.64 million in free cash. Some of this excess was the natural result of disinvestment in working capital as revenues fell, as well as from non-cash restructuring and impairment charges, but the company is to be credited for judicious capital management and spending discipline. Mestek dedicated most of its free cash flow to reducing debt and repurchasing stock below tangible book value, resulting in the strongest and most liquid balance sheet in years and value created for shareholders. Mestek’s unadjusted balance sheet does not account for the company’s material LIFO reserve, so I have adjusted assets and equity, net of tax. I assumed the LIFO reserve was constant since fiscal 2010, though it likely grew along with inventories. While strong in their own right, Mestek’s official results understate the company’s true earnings power. The company recently completed a years-long process of facility consolidation and closing. According to the company, all of its manufacturing facilities are now running profitably. The charges from these closings and consolidations took a significant bite out of earnings in recent years, but are now a thing of the past. Similarly, losses from Carecentric are still reflected in the twelve trailing months earnings. The company’s share of Carecentric’s losses was $1.38 million in 2009, growing to $4.78 million in 2010. Carecentric was sold at the end of the first quarter, 2011, so two quarters worth of losses remain in the twelve trailing months’ earnings. 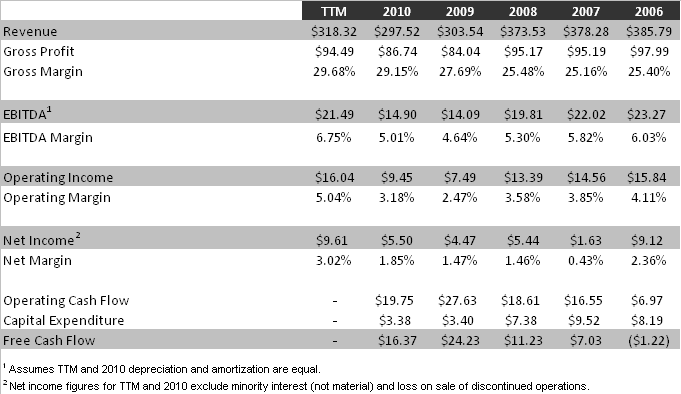 Assuming losses continued at a similar rate in Q1 2011, trailing operating earnings reflect a $2.39 million loss from Carecentric that will not repeat. The display below contrasts Mestek’s actual trailing twelve months earnings with earnings of the same time period adjusted for one-time items. A consistent tax rate is assumed. One time charges have significantly depressed Mestek’s earnings. As these charges moderate or cease in coming quarters, the company’s true earnings power will become apparent. 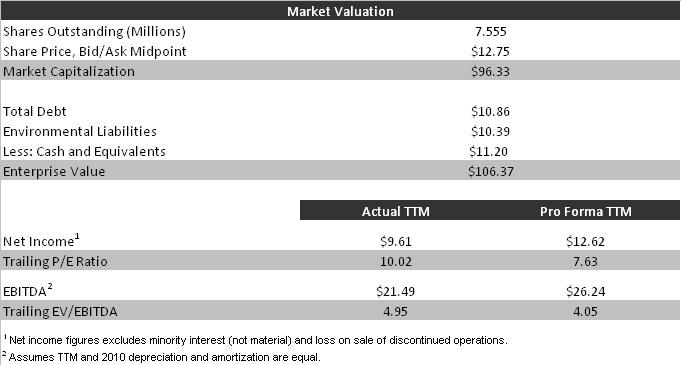 Mestek’s valuation on unadjusted earnings is modest. 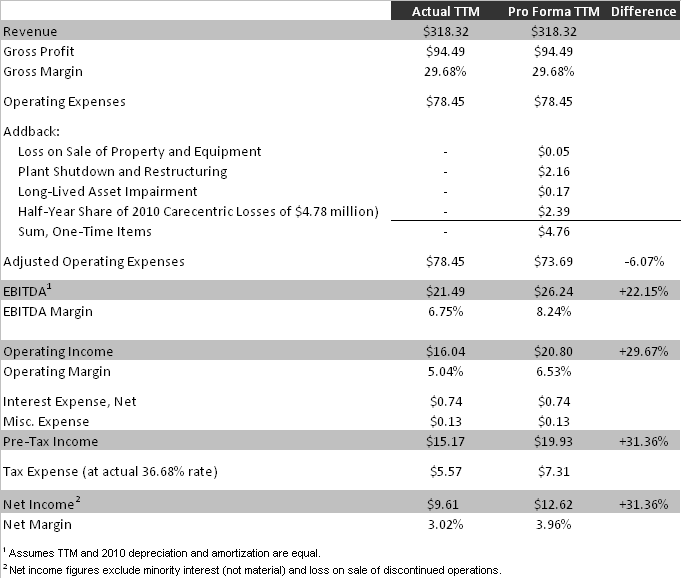 On an adjusted earnings basis, the company’s trailing earnings yield is 13.11%, very generous for a conservatively-financed company that has likely passed the nadir of its revenue cycle. Potential investors in Mestek should be aware of certain issues. First, liquidity in the company’s stock is very poor. Trades occur infrequently and the bid/ask spread is quite wide. A large block of shares would be difficult to dispose of in a rush. Any investment in the company should be considered very long-term in nature. The terms of the company’s going-private transaction required it to conduct a tender offer for $2.5 million worth of stock each year for five years following the transaction. The last of these tenders was completed in November, 2011. The share count reduction from this last tender offer is not yet reflected in the company’s financial statements. I should mention that Mestek has some ongoing environmental liabilities related to former manufacturing sites. The company has reserved generously for these liabilities. The company is also party to a number of asbestos-related lawsuits, but doesn’t believe any of these will result in material losses. Given the controlled nature of the company, it is critical that investors be able to rely on the Reeds to be honest and prudent. The company is party to a few related-party transactions commonly seen in pink sheets companies, including leasing facilities from insiders and extending loans to officers. The scale and terms of these agreements do not seem untoward. One item that may raise eyebrows is the company’s partial ownership of a corporate airplane, used by management for transportation between manufacturing sites. On the other hand, Wikipedia informs me that the aircraft (a 1990 Beechcraft King Air 200) is worth less than 10% of a Gulfstream G650. 4 Responses to Mestek, Inc. Thanks for weighing in! Your fine company certainly ranks among the best I’ve seen for good corporate governance, fiscal prudence and regard for shareholders. I wish you and Mestek many more years of success. A commitment of thankfulness is all together for another magnificent post. What other spot may anybody have the ability to get that sort of information in such a perfect procedure for making?